Successfully Added Portable Solar Battery/Charger In Tough Clamshell Case to your Shopping Cart. High capacity Solar Battery Charger for laptops and portable electronics. Provided with two large panels and a molded clamshell casing, this is the ultimate road companion for anyone who needs a large easily renewable power source while they are on the road. Never get stuck with a dead battery again thanks to this huge capacity clamshell solar charger. 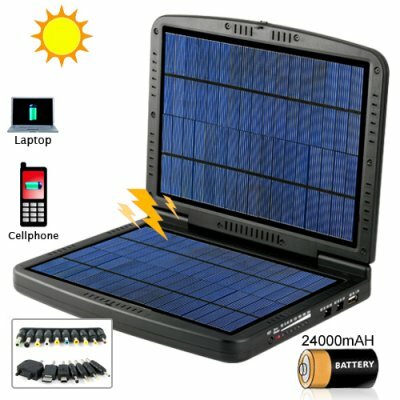 With two solar panels and a built-in high capacity rechargeable Li-ion battery, this unit will have your cell phone, notebook computer or MP4 player charged in no time. There are 16 adapter configurations and 8 different voltage settings to get everything going. Packaged in a rugged clam shell casing to protect the solar panels, you can take this beast anywhere. End your frustrations with weak battery's now, buy a wholesale clamshell solar unit from Chinavasion at an unbelievably low price and have it delivered to your doorstep in a matter of days. well, i thinks all good about these solar battery/charger because i believed they are good and can solve the problem of eletricity in some areas where it's needed.